We are One of the Leading Manufacturer of Gynecology, Orthopedic Implants/ Equipments/Instruments, E.N.T, S.S Holloware, General Instruments and Equipments. Our Range of Items Adhere to the International Quality Standard. We Have Been Supplying Quality Goods at Competitive Prices. Crown Metal Works is an INDIA Based company,Which is a Leading manufacturer of Gynecology,Orthopedic Implants,Equipments,Instruments,Orthopedic Drills,Tools, Hospital Stainless Steel Holloware,E.N.T,,General Instruments and Equipments. The Company was set up By Shri A.N.Bhardwaj Since 1971,The company's strength also lies in custom made instruments. Since its establishment in 1971, the company has succeeded in making its presence felt in the Surgical markets. This is largely due to the superior quality of its products and services. The company is managed by a team of highly qualified personnel & engineers with over three decades of experience & active involvement in this field. A constant endeavour is made to improve the quality of the existing products & introduce new technology concepts. 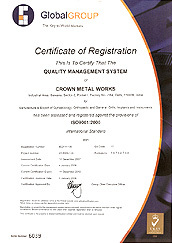 Crown Metal Works invites you to forward your requirements / inquiries / tenders list for its competitive prices.